JNN 17 Apr 2015 Manama : Anti-regime demonstrators across Bahrain have held massive protest rallies, demanding the cancellation of the upcoming Formula One Grand Prix. On Friday, a large number of protesters took to the streets in several areas across the Persian Gulf kingdom to voice their outrage against the upcoming event. The fresh demonstrations came one week ahead of the event, Press TV reported. 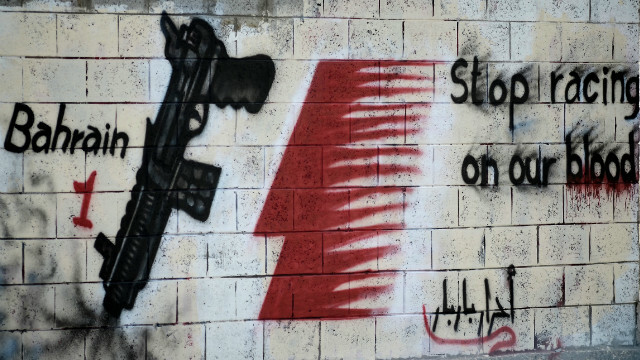 Bahrainis say Formula 1’s governing body, the FIA, should cancel the event over Manama’s ongoing crackdown on protests. Pro-democracy activists across Bahrain have also demanded that F1 bosses cancel the race due to Bahrain’s poor human rights record. The angry demonstrators described Bahrain as an occupied country and slammed the hosting of the Formula One race as a failed attempt to restore Manama’s international image. Anti-regime protests flare up every year ahead of the major sport event. This entry was posted in Middle East and tagged Al Khalifa Regime, Bahrain, Bahraini Majortiy, capital manama, Formula One Grand Prix, Grand Prix, Protest, Protesters, Saar. Bookmark the permalink.